Eugene Vodolazkin’s recent novel “Laurus” is a literary sensation, and its author, a specialist in ancient Russian culture, is now known as Russia’s Umberto Eco. Much of the novel is dedicated to describing yurodstvo, the state of being ‘Christ’s fool,’ an extreme spiritual obsession or even insanity, and a phenomenon perceived as deeply Russian in nature. The fool for Christ, or Holy Fool, is similar to a biblical prophet, prescient, but more importantly able to reveal truths. As one church hymn has it, the yurodivy (holy fool in Russian) strives “with imaginary insanity to reveal the insanity of the world.” He not only fights the insanity of everyday sins but the crimes of the mighty as well. After devastating Novgorod during his reign in the 16th century, Ivan the Terrible moved on toward Pskov. The only person to stand up to him was the yurodivy Nikola Salos. As legend has it, he offered the Tsar a piece of raw meat out of hospitality. 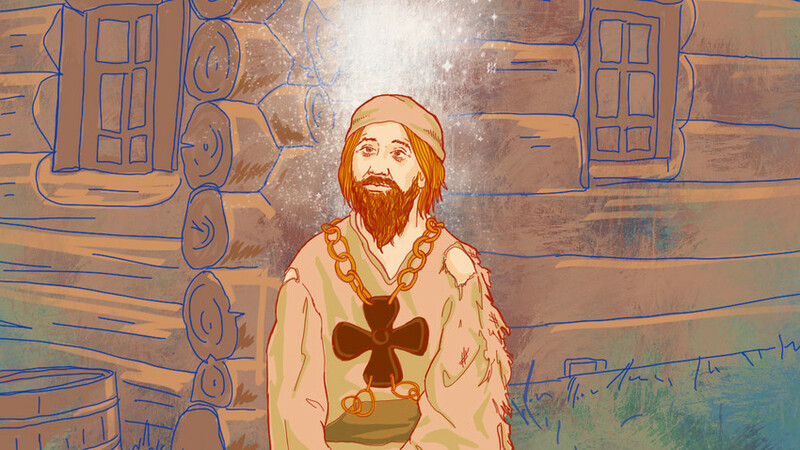 Ivan objected that he did not eat meat during the fast; Nikola retorted that the Tsar did a far worse thing in devouring the flesh of Christians. Startled by the encounter, Ivan the Terrible did not touch Pskov, left the people in peace, and instead returned to Moscow. The fool for Christ, who can still be discovered in contemporary literature and films (such as Pavel Lungin’s “Island”), is someone who has broken away from society. To withdraw into such religious folly is effectively dropping out of mainstream life. It truly is a departure, because a person who chose this path usually left his home region for places where no one knew him. We only know of men for the most part, who “died for the world.” Arriving in strange lands, the fool for Christ did not join his new community. Yet it may still surprise readers that a number of Russian yurodivye were not Russian in origin but came here from the West. This state of existence is characterized by contempt for one’s own flesh. The fool for Christ would go barefoot or even naked all year round, which in Russia means some serious physical endurance. Sleeping in a barn and eating leftovers, the fool for Christ let those around him know that he too was a part of this filth and that he had almost ceased to exist. It is a common fallacy that the yurodivy is often exclusively associated with Russia and ancient Rus’. However the yurodivy existed in Byzantium, too. It is fair to say that Russians are uniquely open toward what most cultures consider the irrational. Perhaps it is no coincidence that on the country’s main square stands St. Basil’s Cathedral, one of the most famous of Russia’s religious follies. People occasionally ask me as a historian of medieval culture if contemporary art performances are also expressions of yurodstvo. In my opinion the answer is no, as they are generally devoid of such spiritual meaning, without which there can be no yurodstvo. The fool for Christ charges around yet avoids recognition, while Bohemian artists do not flee from recognition, but rather seek it actively. The fate of the yurodivy was a tough one, and the physical trials were not limited to cold and hunger. Because their eccentric behavior was far from mainstream, they were often subjected to beatings and even killed. If we consider that it was generally regarded as a major transgression to offend them, then this seems inexplicable. But since committing certain violations often has a special kind of draw, this might explain the beatings. Often it was children who tormented the yurodivy, as a child’s consciousness is still unable to fully distinguish between good and bad. Boys would steal alms from them (as we encounter in Pushkin’s Boris Godunov), and more generally harass them. The fool for Christ would throw stones at the houses of the pious, yet caress the walls of a sinner’s home. But the paradox is imaginary, and is explained by the understanding that the yurodivy sees what is inaccessible to others. Devils cannot abide in the homes of the righteous and so they cluster at the door, fearful to come further, and there he pelts them with stones. But devils live happily in the homes of the sinners, and he converses with the angels that are driven from within. It may seem that the angels were driven from our Russian homes during the years of Soviet power and supplanted. According to legend, the earth cannot stand without three holy men, and maybe they will reveal themselves before long. Contemporary Russia desperately needs people who can pelt devils with stones, but even more, it needs those who can talk with angels.